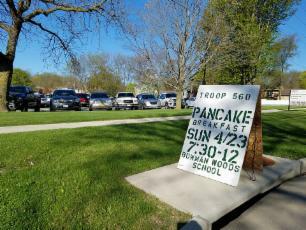 Troop 560 has an annual Pancake Breakfast, where it's all you can eat of pancakes, eggs, and sausage. Many scouts and adults volunteer their time to serve customers, cook the food, or clean the tables. The Pancake Breakfast is held the first Sunday of February at Bowman Woods Elementary School. The Avenue of the flags is a fundraising and service project of the Tuesday Noon Optimist Club of Cedar Rapids. We place 3' x 5' United States flags in front of subscriber's homes on 5 national holidays each year, Memorial Day, Flag Day (June 14th), The 4th of July, Labor Day and Veteran's Day (November 11th). The flags are attached to a 10' metal pole which is placed into a previous placed metal receptacle 24” from the curb directly out from the front door of the home. The receptacle is placed at ground level so as not to impede walking or lawn care. 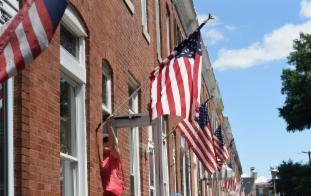 The Optimists store the flags after each holiday and provide us with “route sheets” before each holiday. In the fall the Scouts of Troop 560 sell gourmet popcorn. The Scouts are recommended to sell to family, friends, and neighbors. Some even go door to door selling popcorn or set up a table at a busy grocery store to attract customers. All profits go into an account for the Scout to help pay for campout fees or high adventures. A popcorn participation patch is also available for those who sell popcorn. Depending on how much a Scout sells, he may choose from a variety of popcorn prizes as a bonus. When selling popcorn, the customers place the order and the popcorn is delivered at a later date. Customers are asked to pay when they order. At about the same time that popcorn is being sold, Scouts also have an opportunity to sell greenery. Like popcorn, Greenery is usually sold to family, friends, and door to door. The products that are sold are usually popular due to the holidays. Most scouts prefer selling popcorn to greenery, but it does help sales because not all troops sell greenery. They range from wreaths to ornamental fence lining. Many people buy them for holiday wreaths.